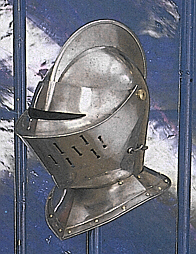 The style of Close Helmet pictured above was a modification of the Crusader or "Barrel Helmet". It was more rounded in shape and included a piece of fluted steel that offered protection for the neck. Probably developed toward the end of the 1300s, its shape and appearance have French and Italian influences. Plumes and crests were often worn in tournaments to pay homage to the family of the competing knight. The Close Helmet was modified many times in its construction and various experiments led to the development of the Burgonet, Armet and the Pig-Faced Bascinet helmets. Originally, the Close Helmet contained vision slits much like its predecessor the "Barrel Helmet". However as the slits still allowed for a well aimed sword tip to enter the helmet, it gradually gave way to the vision and ventilation holes and the removal of the slits. This helmet remained in wide usage up until the late 15th Century.